09.09.2006 - Ah, yet another disgruntled software engineer who's decided to take a walk on the wild side. I myself used to be a software developer, hating my life behind the desk staring at a computer screen (oh wait, that's what I'm doing at this very moment), but when I discovered the fun of working outside catching critters, I haven't looked back. My friend Tim decided that he'd like to do the same thing, so now he's down here with me in Florida, training to be a critter catcher himself. He wants to open his own operation in Portland after six months or so with me. Tim is about the most agreeable person I could hope to work with. He's extremely helpful and polite, and he never messes up. He's got a lot of common sense and he's a good learner and hard worker. He also doesn't mind getting his hands wet with the wildlife. Take this opossum for example. Right after this photo it peed all over his glove, but he didn't mind a bit. If you want to be a good critter catcher, you've got to have more than a knowledge of wildlife. You've got to know building architecture, construction, ladder safety, and more importantly, how to deal with people. Yes, you do have to deal with wildlife, but in the field of human-wildlife conflicts, there's the humans to deal with as well, and many of them are a good deal stranger than the critters, that's for sure. Tim here is great with both, and I'm glad to have him here. We specialize in nuisance wildlife control - this is the field of removing unwanted wildlife from homes and property, and solving conflicts between people and wild animals. 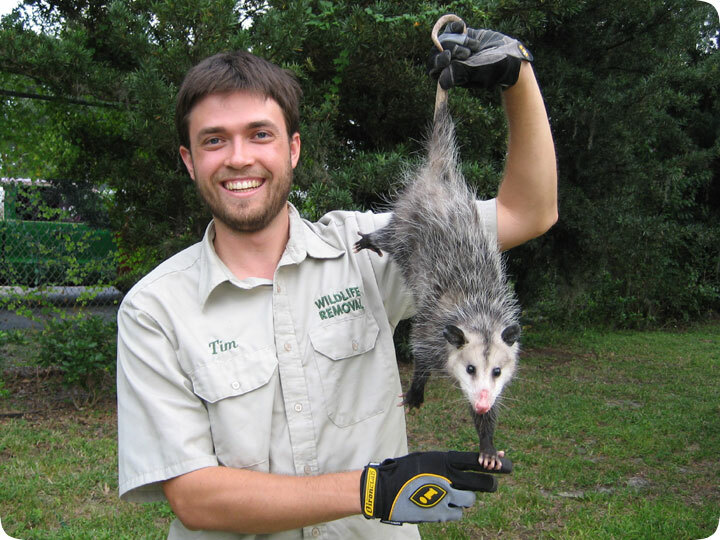 From home inspections to preventative repairs, wildlife trapping, attic cleanups and more, we solve critter problems with professional expertise. Call me, David, or click on the below link to find any one of hundreds of wildlife trappers in every city and town in the US. Do it yourself: Visit my How To Get a Wildlife Removal Job page for tips and advice.